A Perfect Storm is defined as “an event where a rare combination of circumstances will aggravate a situation drastically”. Based on developments over the last few years, it is becoming increasingly apparent that a perfect storm is brewing in the energy space in the country. First, India will continue to experience insatiable energy demand growth over the next several years. According to the Ministry of Power, from a current installed base of 170 GW, India will build up to 316 GW by 2020. In the same time-frame, the demand gap will grow from 19GW to 103GW, an increase of 5x! In this scenario, all types of energy are welcome – conventional, nuclear, and renewable. Second, in spite of having low greenhouse gas emissions per capita, India has already become the 3th largest emitter in the world, according to the International Energy Association. This has created immense international pressure on India to respond. Increasing the percentage of renewable energy in the overall energy mix is one way to take a substantial bite out of the emissions pie. Third, India is endowed with ample raw materials required to generate solar energy. Two ingredients are essential – land and sun – and India has plenty of both. In fact, the best land tracts for solar energy generation are dry and barren, and have little potential for alternate use. Conservative estimates put solar potential in India at about 70GW. More realistic estimates put the potential closer to 500GW. Fourth, solar power technologies lend themselves to the scale effect. With increasing scale comes improvement in yields, efficiencies, quality, reliability, and costs of production. All of these work in concert to drive the levelised-cost-of-electricity (LCOE) down. Combine that with increasing costs of conventional energy, driven by increasing costs of inputs, and the utopian spectre of grid parity becomes achievable in the next few years. Fifth, Indian policymakers are committed to supporting the scale-up while also reducing solar costs. The National Solar Mission employed tariff bidding to allocate 650MW to developers last year. The Gujarat Government has signed PPAs for 950+MW. In future rounds, the tariffs offered by these programmes will reduce, which will drive down the costs of solar generation. Already, capital costs for solar projects have dropped from INR 15-16 crore/MW to INR 12-13 crore/MW. Another government initiative that will drive significant capacity addition is the Renewable Purchase Obligation (RPO) that is being implemented across the country. Distribution companies and captive consumers will have to source a percentage of their energy from renewable sources. This is set at 5% currently and will grow to 15% over the next ten years. Within this, there is a solar-specific RPO of 0.25%, slated to grow to 3% over the same time frame. The RPOs will be implemented through Renewable Energy Certificates (RECs), which will trade within a pricing band established by the CERC. This pricing band will be reviewed periodically and is designed to provide acceptable financial returns to developers . Lastly, in spite of challenges, several hundred MW are likely to be commissioned within the next year. As stated earlier, over 1,600 MW of PPAs have already been signed. While many developers are facing significant hurdles, related largely to acquiring land and achieving financial closure, several projects aggregating 200-300MW are likely to be commissioned over the next year. Not a bad outcome from a standing start! These circumstances are leading to a perfect storm in solar, which should result in over 50 GW installed and over $30 billion invested in solar power in India by 2022. Some Varanasi villages may soon shine under the bright solar lights. An ambitious project ‘Jyotirgamaya’ launched by the Grand Lodge of India. It has established a solar power plant at Amrit Sagar Eco centre of Aghor Foundation in Ramnagar area. The power plant was inaugurated on Thursday last. The system consists of PV solar modules, charger/controller, and storage batteries. The solar plant was established at the cost of Rs. 30 lakh. Through this solar plant solar home lighting would be made available to the local houses, cremation ghat and other public places in the surrounding. The Amrit Sagar centre has been established without harming the nature. The centre has been promoting organic farming, use of organic manure, tree plantation, and environment awareness campaign. In its 50th year of existence the Grand Lodge of India has taken up the project to provide long lasting source of light to people by providing light to remote villages that have no access to power from national grid. As the country suffers through another blistering summer, it only makes sense that this abundant resource is put to some use. Venture capitalists have raised $24.5 billion since 2009 to invest in clean technology or renewable energy in India, and would like to invest more than a fifth of that capital in solar-energy projects, according to researchers VCCEdge and Preqin. 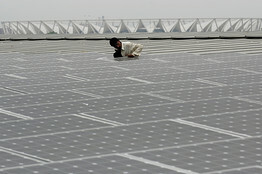 A worker cleans solar panels at the Thyagraja stadium in New Delhi. Their investment is based on the thesis that India will need more energy than it now generates if it is serious about maintaining its economic growth rate of 9%. The nation’s existing fossil-fuel-based power plants cannot keep up with current demand as evidenced by the frequency of power cuts across the country. And, proven coal reserves are expected to last only up to 50 years more. Against this backdrop, the 300 sunny days that the country gets in a year looks like a huge resource boon. Estimates say this free source can be used to generate five trillion megawatts of energy, a huge surplus considering India’s annual consumption is about 848 million megawatts. While this opportunity to be part of a new and rising industry has attracted droves of investors—domestic and foreign—attractive targets are in short supply. Funds such as Blackstone, TPG Growth and Reliance Venture Asset Management Pvt. Ltd. have all paid high premiums on portfolios that involve long developmental pipelines and few operating assets. The solar sector has seen only eight transactions amounting to $100 million in the last three years—a fraction of the money that has been raised to invest in this sector. Shivani Bhasin Sachdeva, chief executive of private equity fund India Alternatives, says solar-power-based power generation needs greater economic support than say, wind-based and small-hydropower projects, as the latter sources are on the verge of reaching grid parity—the point at which an alternative means of generating electricity is economically on a par with a conventional technology such as coal-based-generation. The Indian government is doing its bit. In 2009, the Central Electricity Regulatory Commission—which promotes efficiency and competition in bulk electricity generation and transmission— launched the ambitious Solar India Initiative to be deployed over 19 years. Its three-phase plan works toward generating 20 gigawatts of solar energy within 12 years. “When the solar policy was announced 15 months ago, there was a kind of gold rush into the sector,” said Alan Rosling, founder and chairman of Kiran Energy Solar Power Pvt. Ltd.
His company received $30 million this year from New Silk Route Advisors Pvt. Ltd, Bessemer Venture Partners India and Argonaut Ventures LLC and is engaged in developing solar projects. Initially, new entrants thought it would be easy to reap quick returns but the first round of bidding, led by the government, for the purchase and sale of power under the National Solar Mission (dubbed the Vidyut Vyapar Nigam scheme) “was a very good way of shaking out players who were not serious,” Mr. Rosling said. Indeed 418 applicants competed for 30 government contracts for the purchase of solar power from private industry, said Sanjay Chakrabarti, leader of the national clean technology practice at Ernst and Young. This indicated a high level of interest in a relatively underdeveloped sector that had few experienced players, he said. Government-backed incentives, mandatory use of locally manufactured equipment and solar purchase obligations for utility companies have helped the Indian solar sector emerge as a safe bet as investors are assured of long-term annuity returns, said Yogesh Mathur, chief financial officer at Moser Baer Group. The maker of compact discs and electronic devices decided to take the plunge into solar power and is, today, the country’s second largest maker of solar cells and the fifth largest maker of solar modules—panels that convert sunlight into electricity. Despite government support, execution of these plans is plagued by delays. For investors, the buzz fades somewhat when they realize that initial returns are less than expected due to gestation periods of up to 25 years, and a complexity of implementation that’s greater than expected. But there are benefits too. That’s why there’s more money likely to come in with another 29 India-focused funds looking to raise $6.79 billion for investing in companies that produce energy using renewable sources or engaged in activities that have a minimal or beneficial impact on the environment. Where they will put all this money isn’t clear but in a few years, India is on track to “emerge as one of the biggest solar energy markets globally,” said Moser Baer’s Mathur. A recent KPMG report finds that the Indian economy faces increasing challenges in terms of energy policy, and that the seeds have been sown for a rapid and scalable solar sector “in the very near future”. India‘s photovoltaic potential requires $110 Billion in capital. Image: Flickr/Barefoot photgraphers of Tilonia. India’s growing economy and energy demands are increasingly reliant on energy imports, in the form of coal and oil. Coal dominates India’s energy mix and the economy writ large faces constraints in the form of unreliable and fragmented electricity supplies. The Indian Planning Commission has forecast the country faces 12 percent electricity shortfalls during hours of peak consumption. In this environment, and with reliable year-round sunlight in some regions, solar and photovoltaic generation has the potential to take off and save the country $5.5 billion in coal imports over the next decade, write KPMG’s report authors. The Indian solar sector is yet to become mature and replicate the nation’s successes in the information technology (IT) and auto industry. However, with significant investment it could be transformed. The KPMG report, The Rising Sun, breaks down the investment in solar required to facilitate such a transformation into five year periods, coming to the conclusion that $20 billion is needed between 2012 and 2017 and $92 billion between 2017 and 2022. These figures combine both small-scale and off-grid installations, and large-scale solar farms. In the photovoltaic sector, KPMG predicts that with such investment levels, the Indian vendor market would increase correspondingly by over $14 billion over the next decade. In industries related to photovoltaics – but not exclusive to the field – the vendor forecasts are also for rapid growth to reach $9 million in 10 years. KPMG also sees room for growth and investment in photovoltaic related technologies in India, including storage technologies; non-module equipment such as inverters, which are not presently manufactured in India; and integrated systems and applications, such as agricultural pump systems. Furthermore, the report identifies great potential in India as a low cost photovoltaic manufacturer. The report also found that solar and photovoltaic industry trends favor a rapid expansion in India with falling costs and technological advances facilitating growth in both large scale and rooftop generation installations. In both cases, grid parity in India, as projected in the KPMG report, could be achieved in as little as six to eight years. Using this timeline, the report forecasts exponential growth in both the annual and cumulative solar markets. Off-grid potential is also seen to be great with the report highlighting the potential of telecom towers as photovoltaic installation sites. Many are situated in areas with “limited or no grid connectivity” and at present rely on diesel fuel. With projected expansion in the number of such towers in rural and urban areas, the fuel requirements could amount to 3.5 billion liters per annum by 2020. At present, photovoltaic installations are price competitive with diesel and if a projected 30 percent reduction of diesel reliance is achieved, a saving of 5.4 billion liters over 10 years could be delivered. KPMG sees the role the government could play in realizing India’s solar potential as being crucial, and the report was supportive of the Jawaharlal Nehru National Solar Mission (JNNSM), which was launched in late 2009. The JNNSM set a target of a 22,000 megawatt production capacity in on- and off-grid production, to be realized by 2022. Regional governments also have a role to play in realizing India’s solar potential and KPMG reports that the states of Rajasthan, Gujarat and Tamil Nadu have significant potential in that their solar installation rates are high as are their conventional power costs. Securing funding for the Indian solar sector is crucial, write KPMG, and government here is an important player. While solar technologies are yet to be widely proven in India, their may be a reticence in the banking community to provide funds and the Indian government has moved to educate the sector’s potential. The KPMG report also highlighted the potential of Indian manufacturing, and research and development facilities. Here, a governmental role could be decisive, on both state and national levels, and time delays in pursuing tax credit or support schemes in this field could be crucial in reaching the envisage significant solar potential. Lanco Solar, a subsidiary of Lanco Infratech Limited, in consortium with Juwi Renewable India Ltd, has received a letter of award, or LoA, from Maharashtra State Power Generation Co Ltd, or Mahagenco, for building a 75MW Crystalline technology based photovoltaic, or PV, solar power project in Dhule district in Maharashtra. The project value is INR8.84 billion. The project would be fully commissioned by mid February 2012. Madhusudhan Rao, Chairman, Lanco Group, said, “India’s solar power generation capacity will reach 68,000 megawatts (MW) by 2021-22, triple the government’s target. To pursue the same, we at Lanco has given utmost importance to build on capacities on solar power generation which is also the need of the hour and aims to have 300 MW in generation next two years & in EPC aims to have 300-500 MW of solar thermal and solar PV plants over the next couple of years. KANPUR: Union minister for renewable energy Farooq Abdullah stated here on Friday that his ministry was helping Indian Institute of Technology-Kanpur in conducting research, development and popularisation of solar energy. The ministry has also allotted a research project to the Institute in this regard. Abdullah said that it has become necessary to stop relying too much on non-renewable sources of energy like coal. The project has been handed over to IIT-K to promote research in solar energy and bring it closer to the people. The minister said that his ministry has been promoting solar kitchen in a big way, keeping in view the fact that solar kitchens are much in use at religious places like Vaishno Devi, which are thronged by thousands of devotees every year. He said that a sum of Rs 570 crore have been allocated for generating solar energy in Laddakh to encourage cooking through solar power. Solar power is used to cook food for around 50,000 people in Golden Temple. He said that under the Jawaharlal Nehru Solar Mission which was inaugurated by Prime Minister in January, one hundred megawatt of power could be generated through solar energy by 2013 and over 20,000 megawatt by 2022. “Through wind energy, we will be generating more than 13 megawatt of power, he said while talking about the ambitious plans of his ministry in near future. He also mentioned that the tidal energy could be of a considerable help in generating power and that the scientists were making efforts to generate power through this form of energy. New Delhi: Amid a growing debate over environment and development, Prime Minister Manmohan Singh on Sunday said his government will “stay sensitive” towards green concerns but maintained that the pace of development should not suffer in the process. Observing that the environmental issues have “acquired a new urgency” in recent years, the Prime Minister emphasized the need to work with renewed energy to address green concerns. “While we stay sensitive to environmental concerns, we will also strive to ensure that the pace of our development does not suffer in the process,” Singh said in the UPA government’s annual report presented to the people on Sunday. “We need to work with renewed energy to address environmental concerns if we wish to make our growth processes sustainable and give our people a better quality of life,” he further said. The Prime Minister also referred to various green steps taken by his government during the year 2010-11 which included the establishment of National Green Tribunal, sanctioning of Rs 2,500 crore under Mission Clean Ganga and launching of Jawaharlal Nehru National Solar Mission. Climate Change, including the eight national missions which are a part of the Plan,” Singh added. According to the report, the Prime Minister’s Council on Climate Change has considered all eight climate change related national missions. The eight missions are the Jawaharlal Nehru National Solar Mission, National Water Mission, National Missions on Enhanced Energy Efficiency, Sustainable Habitat, and Strategic Knowledge for Climate Change, and the National Missions for Sustaining the Himalayan Ecosystem, a Green India and Sustainable Agriculture.